In my previous post, I showed you the storyboard, sketch and finished image of a selected spread from ‘Danny the [trainee] demon’, a children’s book I wrote and illustrated a year or two ago. In this post I’ll be showing you the same process with a spread from further on in the book. Why? Well, as another helpful example of how how my ideas make the tortuous journey from my brain to glorious completion. As I’ve stated previously, this is how the process works for me – but I hope you also find it useful, yet entertaining. This is the stage where I pour my brain out onto the paper. If the illustration is part of a book – as in this example – I storyboard every spread. And, because I write the book before I begin the illustrations, I include the text in the storyboard. It also helps me identify any places where the story doesn’t flow. You can see in the storyboard extract above, that I decided to add two more spreads, which I scribbled down as thumbnails. I felt the story was moving too quickly, so wanted to slow it down with an additional scene, over two spreads. These extra scenes served to give Danny’s character more depth, and they were fun to draw too. 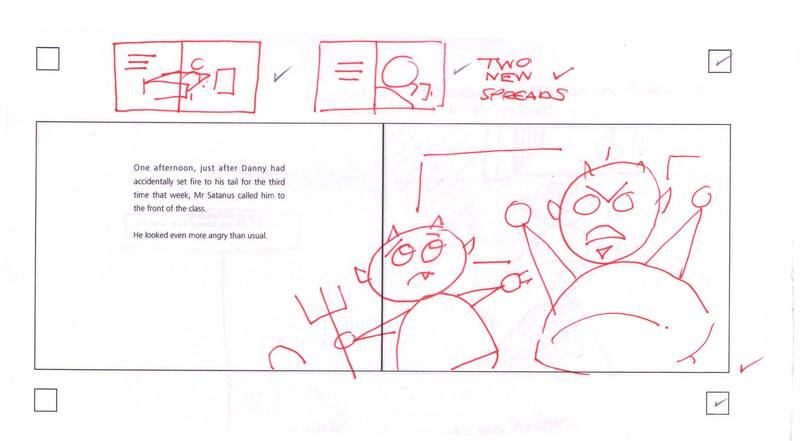 This storyboard section shows the titular Danny being yelled at by his deeply demonic teacher. And you thought normal teachers were tough! 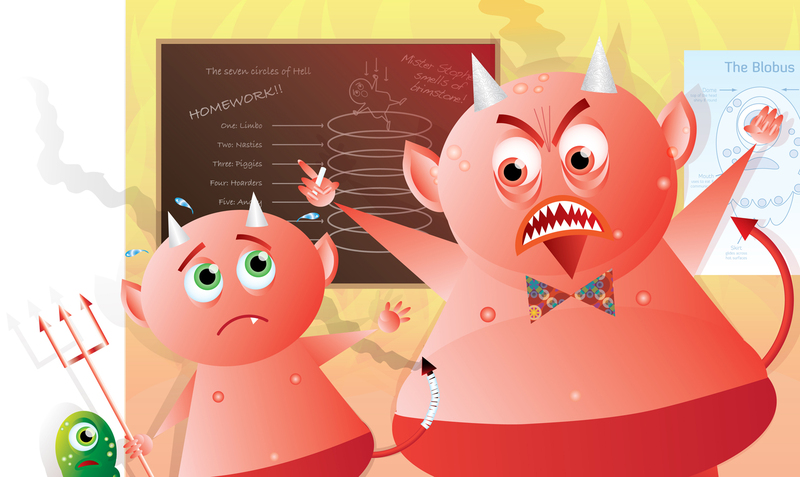 Poor old Danny – it isn’t easy being a trainee demon. This rough image gives me the composition of the illustration, including the fact it bleeds onto the text page. I’d like to say it’s ‘deceptively simple’, but it’s actually just simple! Here’s the finished illustration. 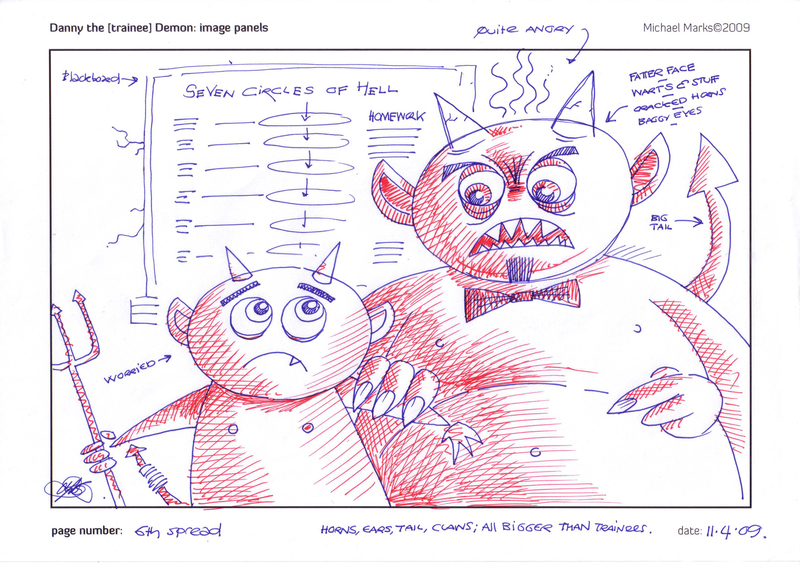 Interestingly, the composition of the final spread is closer to the storyboard scribble than the rough sketch. However, the elements from the sketch are here too: Danny’s bandaged, smoking tail and the homework on the blackboard. Danny’s teacher is also looking as angry as I intended. As mentioned in the previous post, the little green ‘Blobus’ features in every spread, so there he is, lurking behind Danny, in the bleed. I’ve even added a diagram of him on the wall, to acknowledge the character. In my final ‘Danny’ post I’ll show you the same process with the scariest spread in the book. If you like your demons horny, spiny and warty, this one’s for you.